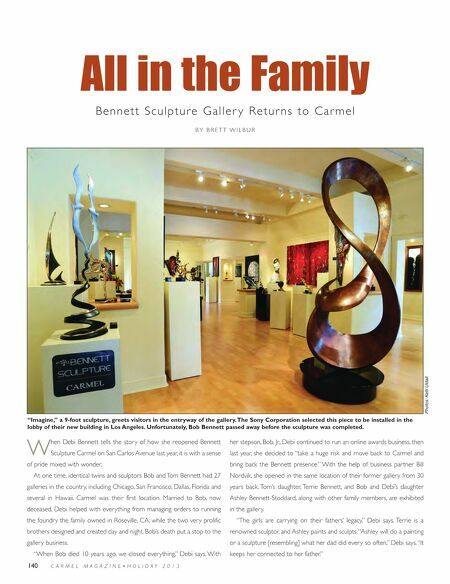 140-143 Bennett Sculpture Gallery_Carmel Mag 10/23/13 9:41 PM Page 1 All in the Family Bennett Sculpture Galler y Retur ns to Car mel Photos: Kelli Uldall BY BRETT WILBUR "Imagine," a 9-foot sculpture, greets visitors in the entryway of the gallery. The Sony Corporation selected this piece to be installed in the lobby of their new building in Los Angeles. Unfortunately, Bob Bennett passed away before the sculpture was completed. W hen Debi Bennett tells the story of how she reopened Bennett her stepson, Bob, Jr., Debi continued to run an online awards business, then Sculpture Carmel on San Carlos Avenue last year, it is with a sense last year, she decided to "take a huge risk and move back to Carmel and of pride mixed with wonder. bring back the Bennett presence." With the help of business partner Bill At one time, identical twins and sculptors Bob and Tom Bennett had 27 Nordvik, she opened in the same location of their former gallery from 30 galleries in the country, including Chicago, San Francisco, Dallas, Florida and years back. Tom's daughter, Terrie Bennett, and Bob and Debi's daughter several in Hawaii. Carmel was their first location. Married to Bob, now Ashley Bennett-Stoddard, along with other family members, are exhibited deceased, Debi helped with everything from managing orders to running in the gallery. the foundry the family owned in Roseville, CA, while the two very prolific "The girls are carrying on their fathers' legacy," Debi says. Terrie is a brothers designed and created day and night. Bob's death put a stop to the renowned sculptor, and Ashley paints and sculpts. "Ashley will do a painting gallery business. or a sculpture [resembling] what her dad did every so often," Debi says. 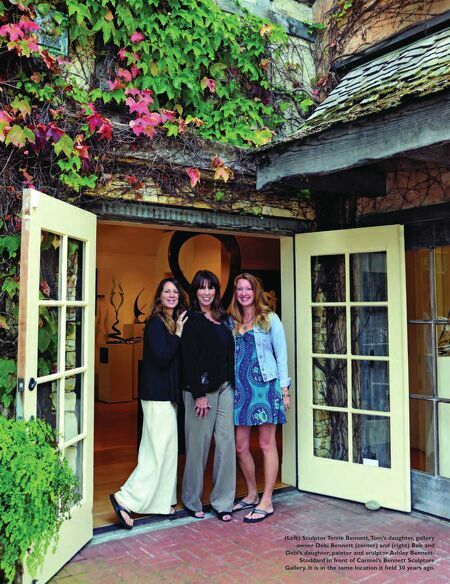 "It "When Bob died 10 years ago, we closed everything," Debi says. With 140 C ARMEL M AG A Z I N E • H O L I D AY 2013 keeps her connected to her father."